In Dice Brewing, the players become young, novice brewers who fight to become the head Brewer in a local brewery. Their goal is to acquire resources needed to brew the beer and to get new recipes and rewards that come with them - gold and mastery points. To do so, each player uses player boards along with marketplace and black market cards that let him develop the resources he owns (dice) and acquire special ingredients tokens and action tokens. 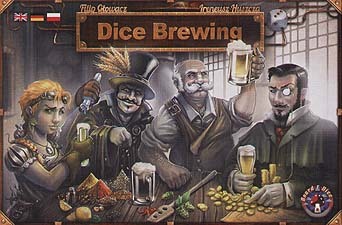 Dice Brewing is a game with easy-to-learn mechanics, that delivers plenty of decisions and choices to make along with various ways to alter the course of the game.